Hawaii was once a mecca for MMA fights. In the beginning, it was virtually a requirement for the whos-who of the sport to pass through the islands on their way to the top. It has been over a decade since a large show as taken place in Hawaii. In mid-December, Bellator MMA will host not one, but two shows back-to-back on the island. 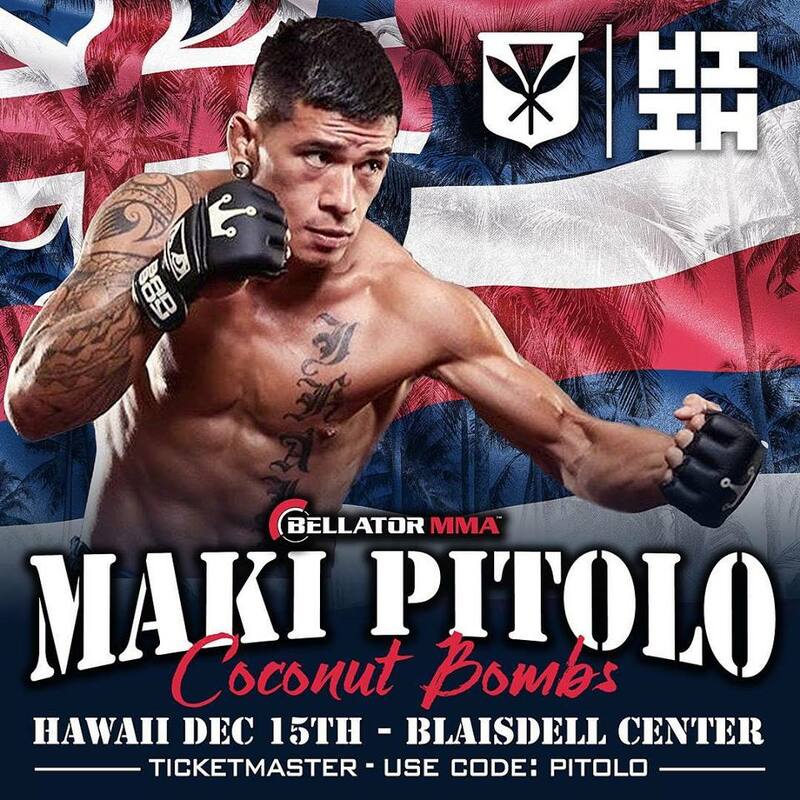 This is a huge opportunity for the masses of Hawaii fighters who have struggled to be noticed, often having to pay their own way to the mainland to find fights on bigger shows. 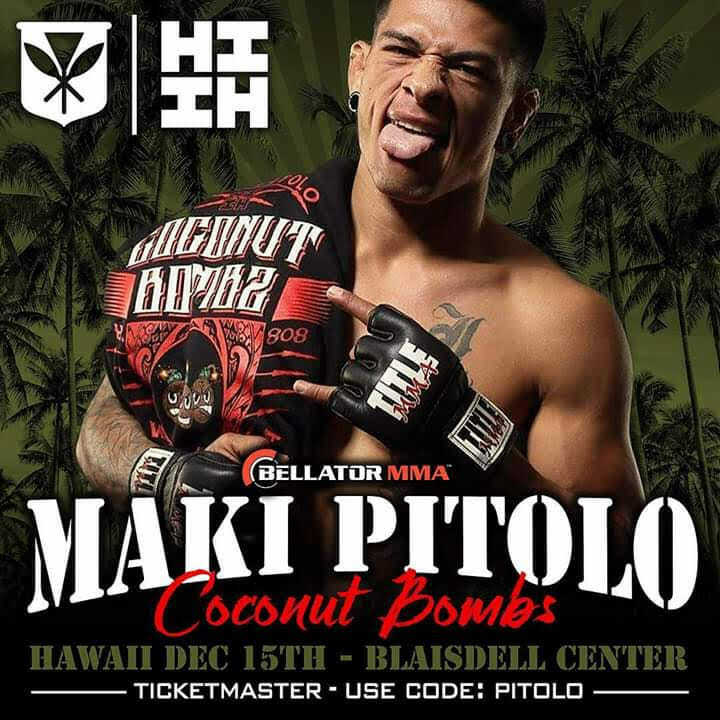 One such fighter is Hawaii’s Maki “Coconut Bombz” Pitolo. No stranger to the spotlight, Maki Pitolo is one of the lucky few who has had a taste of life in the big leagues. Pitolo competed multiple times in the midwest for Victory Fighting Championship on UFC Fight Pass. Earlier this year Pitolo was chosen to be on Dana White’s Tuesday Night Contender Series but was forced to withdraw due to injury. Bellator 213 could be the opportunity he and a large handful of other fighters have been waiting for. Maki Pitolo started training as a youngster to keep in shape for football. He took his first fight at age 17. He’s 27 now and believes this is what he is meant to do. “I started out kickboxing. I never even knew about MMA. Then I watched a fight, and I knew I needed to learn how to do that!” said Pitolo. “My whole family was a little sketched out at first. None of them are fighters. I learned how to defend myself growing up, but nothing like I know now. I’m the first generation for fighters in my family. A fair number of the fighters coming out the islands are from families that have been in the fight business for generations. Hawaii is home to some of the oldest MMA schools in the nation. Maki Pitolo trains at West Oahu MMA and cross-trains at Gracie Technics. Both schools are home to a host of successful fighters and great training partners. 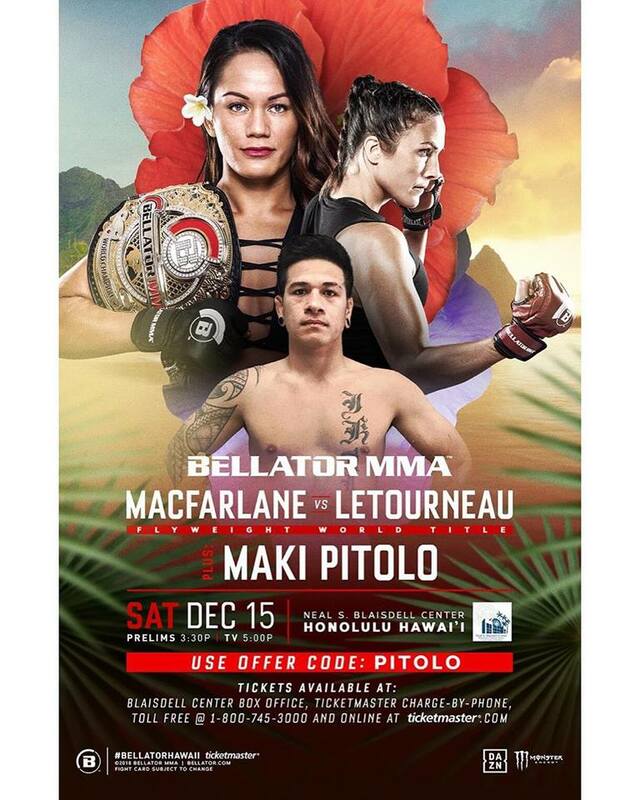 Maki will be featured on the Bellator 213 card which takes place in Honolulu, Hawaii at the Blaisdell Arena on December 15th. 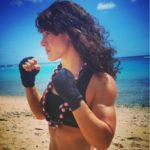 Hawaiian female flyweight Ilima-Lei Macfarlane will headline the card against Valerie Letourneau for the flyweight title. The co-main event is UFC veteran, Lyoto Machida vs Rafael Carvalho. Bellator MMA will also host an additional card specifically for the military troops based on Oahu called “Bellator Salutes.” It will be held at the Blaisdell Arena in Honolulu on December 14th.